Robin, a lawn care business in the Dallas area, has 50 new employees, but they aren’t human. The company recently embraced new robot technology, and they anticipate adding 50 – 100 more of these robotic wonders to their staff each month. 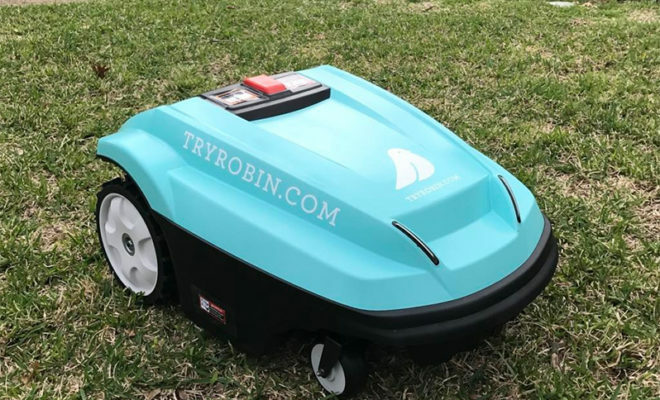 According to TryRobin.com, for about $99/month, they will happily set you up with a robo-mower that quietly cuts your lawn a little bit each day. Much like a Roomba, the machine will return itself to its docking station to recharge after it mows within the wired perimeter. Robin will still send out their human employees to take care of the “trimming, edging, weeding, and other service needs” and to maintain the new robot. The robotic mowers have been in demand in Europe for some time, but with a $1,500 to $4,000 price tag and the popularity of fences, they’ve taken a while to catch on in America. Robin beat the fence issue by creating and patenting little doors for the robot to move through. And when it comes to concerns about theft, Robin has thought of that, as well. They’ve added GPS trackers and warning stickers to the machines.